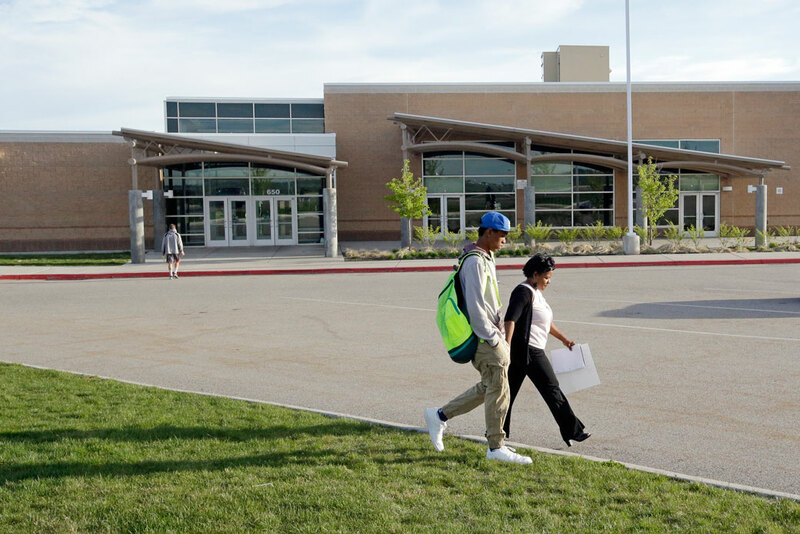 A woman and her son walk across the property at a junior high school in South Ogden, Utah, May 2016. States, teacher preparation programs, and alternative certification programs are taking steps to build a more diverse and selective pool of educators. This report examines the case for making candidate diversity and ability equally important criteria in the recruitment and selection of teachers. Looking at available evidence, the report shows that rigorous recruitment and thoughtful selection processes can achieve increased diversity and selectivity simultaneously. It also includes examples of states, institutions, and organizations that have done an exemplary job of setting a high bar for admission and ensuring the diversity of their teacher candidates and the emerging teacher workforce. Teachers of color tend to have more positive perceptions of students of color—both academically and behaviorally—than other teachers do. A recent study found that African American teachers are less likely than white teachers to perceive African American students’ behavior as disruptive.21 Likewise, when a black student has both a nonblack teacher and a black teacher, the black teacher tends to have a much higher estimation of the student’s academic abilities than the nonblack teacher.22 In both of these studies, the reverse did not hold true: Perceptions of white students’ behavior and academic ability were similar regardless of their teacher’s race. For all the reasons outlined above, increasing teacher diversity is an important aspect of improving educational equity for all students—especially for students of color. Another important aspect of a quality education is ensuring that teachers have the knowledge and skills to provide excellent instruction, which can be accomplished in part by more carefully selecting who becomes a teacher and how that person achieves that role. In the United States, students who are fortunate enough to have a great teacher for even one year are more likely to matriculate to college, attend more prestigious colleges, and earn more later in life.40 Unfortunately, though they stand to benefit most from great teaching,41 disadvantaged students are more likely to be taught by inexperienced or ineffective teachers than nondisadvantaged students.42 As a result, they far too often miss out on these benefits. Raising the bar for entry into the teaching profession is one potential way to ensure that more teachers are able to accelerate students’ learning. While there is not a clear causal effect between a teacher’s own academic record and his or her ability to achieve the kinds of learning gains that help students excel, most studies do find a correlation between higher GPA and teacher effectiveness.43 Taken in aggregate with other factors, such as experience and rank of undergraduate school, some studies have found larger positive impacts, especially for math achievement.44 For this reason, a high GPA should not be the only factor that determines entry into the profession. As later sections of this report discuss, a number of other measures that could better predict future teaching ability are currently in development. These trends have led researchers,47 journalists,48 multinational consulting companies,49 and teachers unions50 alike to call for changes to raise the bar for entry into the teaching profession. As a result of these calls for improvement, many states and preparation programs have begun to make significant changes. In 2011, only two states had set a high academic bar—either through GPA requirements or through an assessment—for admission into teacher preparation programs. By 2015, however, 25 states had done so.57 These changes came in many forms, as there are many measures of selectivity in the teaching profession. Table 1 captures selectivity requirements for admission into teacher preparation programs and entry into the profession. The Center for American Progress (CAP) has previously called for more selectivity in the teaching profession and increased diversity of the teacher workforce.59 Therefore, when some in the education policy community raised these concerns, CAP decided to take a look at the data. But first, this report acknowledges and responds to some of the challenges that exist when working toward these equally important goals. With the right strategies, it is possible to meet selectivity and diversity goals simultaneously, yet doing so presents unique challenges. The teacher pipeline has fewer potential teachers of color relative to the percentage of the U.S. population. Because of the systemic racism that still exists in U.S. society, people of color are more likely to have experienced poverty and received a lower-quality education than their white counterparts, yielding a comparatively lower percentage of students of color who graduate from four-year institutions. Figure 1 illustrates how the pool shrinks from one major educational milestone to the next, first slowly, then precipitously. The current U.S. adult population is 65 percent white, non-Hispanic; 15 percent Hispanic or Latino; and 12 percent African American. Eight percent identify as another race or as more than one race.60 High school graduation and college enrollment rates are relatively similar to the racial and ethnic background of the population as a whole,61 but people of color are underrepresented among four-year college graduates as a result of various factors. 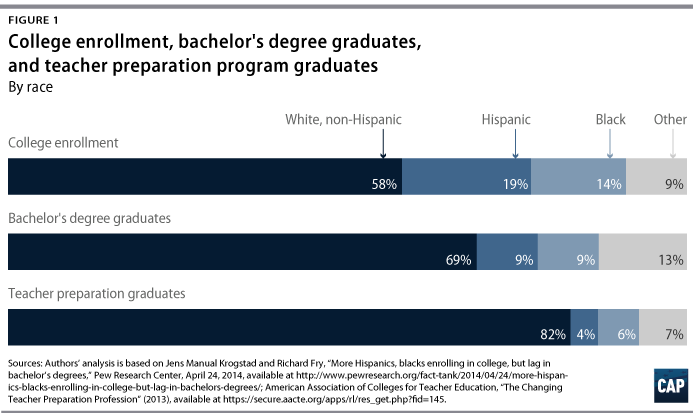 Much more lucrative and prestigious job choices exist for talented students, particularly students of color. The nationwide average salary for a doctor in general practice is $186,320; for an attorney, it is $133,470. For an elementary or middle school teacher, however, it is only $57,080.73 With relatively lower pay compared with other professions, working conditions that are often difficult, and little in the way of opportunities for career advancement, teaching can be a hard sell for talented students capable of entering any of these professions. There is not definitive evidence concerning the appropriate academic bar for selectivity. While GPAs and standardized tests impart useful information, they are better predictors of college success than classroom teaching effectiveness, and there is no evidence that a specific GPA threshold is necessary to be a high-performing teacher. Future research may reveal that the advent of new, more rigorous college- and career-ready standards will lead to a stronger link between teachers’ effectiveness and their prior academic performance, but the standards are currently too new to know for sure. On the other hand, too much flexibility around academic selectivity standards can have the same effect as not having a standard at all. Very strict standards lack a strong research base and can arbitrarily exclude promising candidates. Rather than having a specific GPA bar for all candidates, implementing a cohort GPA requirement or a required average GPA of an education program’s incoming cohort allows for some flexibility for individual candidates while simultaneously raising the bar for entry into the profession. Despite these challenges, increasing both the diversity and the selectivity of the teaching profession is possible, and both states and teacher preparation programs are proving that it can be done. As mentioned previously, some states have made significant efforts in recent years to increase the selectivity of the teaching profession by raising the bar for entry. Although there has been some recent backsliding, between 2011 and 2015, 25 states raised the bar for selectivity through entrance examinations, GPA requirements, or both.85 This section looks at the states that implemented increased selectivity requirements before 2012; at how nearly all states have made some recent strides to increase the selectivity of their teacher preparation programs; and at two states that have successfully set a high bar for selectivity while maintaining or increasing diversity. Nine states—Alabama, Georgia, Hawaii, Indiana, Iowa, Kentucky, Oregon, Rhode Island, and Texas—have increased the selectivity of their examinations for entry into teacher preparation programs between 2006 and 2014. In order to analyze the impact of changes to selectivity requirements, states must have made changes to entrance examinations before 2012 for these data to be available. In these states, we analyzed whether the percentage of students of color pursuing a degree in education declined after the state increased selectivity. Busting the myth that diversity and selectivity in the teaching profession are at odds, these data show that in most states, the diversity of undergraduate education majors actually grew following the increases in selectivity. (see Table 4) These changes tracked closely with the increasing diversity of these states’ overall undergraduate student bodies; in some cases, the growth in diversity among education majors exceeded the rate of growth in the student body overall. Alabama was the only state in this analysis that saw a decrease in the percentage of students of color among education majors. However, the decrease was very small—1 percent—and the growth in students of color in the overall student body was only 2 percent. In all other states that increased the selectivity of entry into teacher preparation programs, the percentage of students of color increased among education majors as well as among the entire student body in the years examined. In Kentucky, for example, the percentage of students of color among education majors and the overall student body both increased by 6 percent. Hawaii, Indiana, and Texas also saw increases in diversity among education majors and the overall student body. Most notably, in Georgia, Iowa, Oregon, and Rhode Island, the increases in the percentage of students of color among education majors exceeded the increases in students of color in the overall student body. In Georgia, the percentage of students of color among education majors grew 14 percent between 2006 and 2014, while the increase in students of color in the overall student body amounted to 10 percent. Similarly, in Oregon, the percentage of students of color among education majors grew 8 percent, while the change in students of color in the overall student body increased by 5 percent. Rhode Island also followed this trend, with an increase in education majors of 5 percent among students of color and an overall increase of 4 percent. In Iowa, while the diversity of the overall student body decreased by 2 percent, the percentage of students of color majoring in education increased by 15 percent. 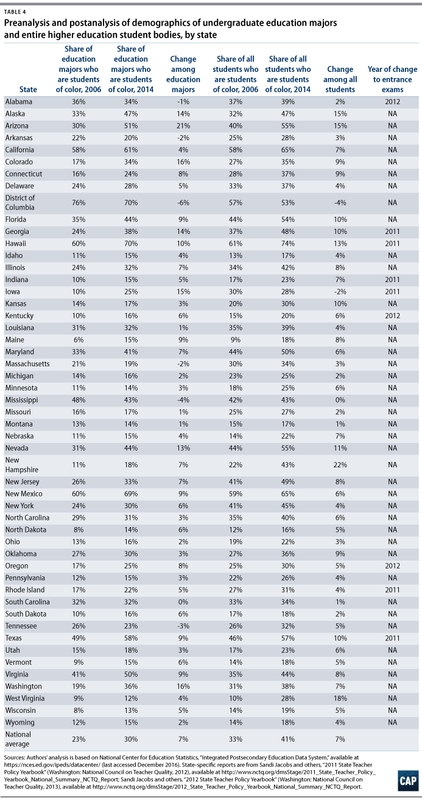 What’s more, in the remaining 41 states and Washington, D.C.—which did not increase their selectivity standards during the time period analyzed—five states—Arkansas, Washington, D.C., Massachusetts, Mississippi, and Tennessee—saw an overall decrease in the percentage of students of color among education majors, and 24 states saw less of an increase in the percentage of students of color among education majors than in their student bodies overall. 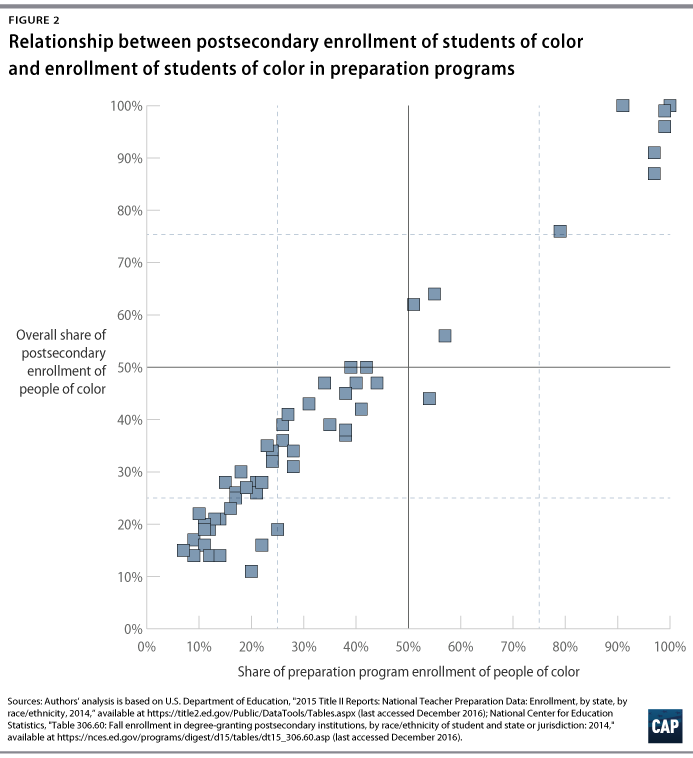 In sum, these data belie the notion that increasing selectivity has a negative impact on diversity, instead suggesting that increasing selectivity may even encourage students of color to enter the field of education. In addition to changes in entrance examinations for teacher preparation programs, many states have opted to implement a high school GPA requirement for students entering teacher preparation programs. While states such as Louisiana were making such changes as early as 1999,86 changes are ongoing. Higher GPA requirements took effect this past year in New Jersey,87 and such changes will take effect in Alabama in fall 2017.88 For this reason, it is not yet known how or whether these changes will affect the diversity of students enrolling in and graduating from teacher preparation programs. Nevertheless, it is illuminating to understand just how much the selectivity landscape has changed in recent years. Table 5 illustrates these changes. The average GPA of its accepted cohort of candidates meets or exceeds the CAEP minimum of 3.0. Currently, 22 states require their public colleges and university educator preparation programs to have CAEP accreditation.91 An additional eight states have a 3.0 GPA requirement—either cohort or individual—even though they do not require all teacher preparation programs in their state to be CAEP-certified. Because of the recent nature of these changes, more years of data are needed to do the type of analysis the authors completed for changes in entrance exam requirements, even for states that enacted these changes first. Although much of this work is still in its earliest phases, a few states have done an exemplary job of thinking through interactions between selectivity and diversity and making a concerted effort to ensure that they are achieving both. The efforts in Rhode Island and New York are profiled below, showing that it is possible to create effective policies with an eye toward these dual goals. Approved programs demonstrate responsibility for the quality of candidates by ensuring that development of candidate quality is the goal of educator preparation in all phases of the program—from recruitment, at admission, through the progression of courses and clinical experiences—and in decisions that program completers are prepared to be effective educators and are recommended for certification. 3.1 Diversity of Candidates: Approved programs recruit, admit, and support high-quality candidates who reflect the diversity of Rhode Island’s PK-12 students. 3.3 Admission Standards for Academic Achievement and Ability: Approved programs set admissions requirements that meet or exceed RIDE expectations as set forth in documented guidance and gather data to monitor applicants and admitted candidates. RIDE has left programs more discretion to identify and adopt the additional selectivity criteria that indicate other “research-based traits … that are critical to educator effectiveness.”106 Each school will select, implement, and justify its own additional measures. RIDE notes that it will continue to use quarterly meetings with program deans and directors to unpack and understand the new expectations and to identify next steps. Although New York state did not specifically set out to increase the diversity of its teacher workforce when making these changes, it was able to accomplish this goal while significantly increasing the selectivity of the profession. Yet it is important to include a closing word of caution about New York. The basic skills tests required for entry into teacher preparation in the state—only a small part of the selectivity measures described above—have recently come under fire for being biased against African American and Latino test takers, as their passage rates are significantly lower than those of white test takers. This is also the case with other tests given for entry into teacher preparation programs. See Table 2 for similar data related to the Praxis I. 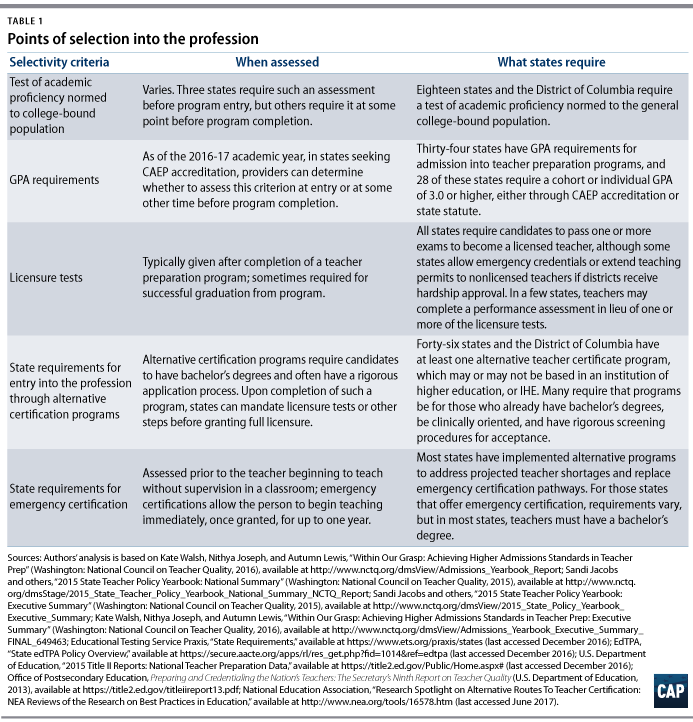 While several states have been successful at increasing the selectivity of their teacher preparation programs through statewide policies, these programs also have considerable leeway to make their own entrance requirements more selective. States have the ability to increase selectivity while maintaining or modestly increasing diversity, but programs have the ability to use recruitment to both increase the pool of qualified candidates and take a more individualized and personalized approach. Together, these tools can have a dramatic effect. This is important because marginal increases in teachers of color will not be enough to ensure that the teacher workforce more closely reflects the diversity of the nation’s students. 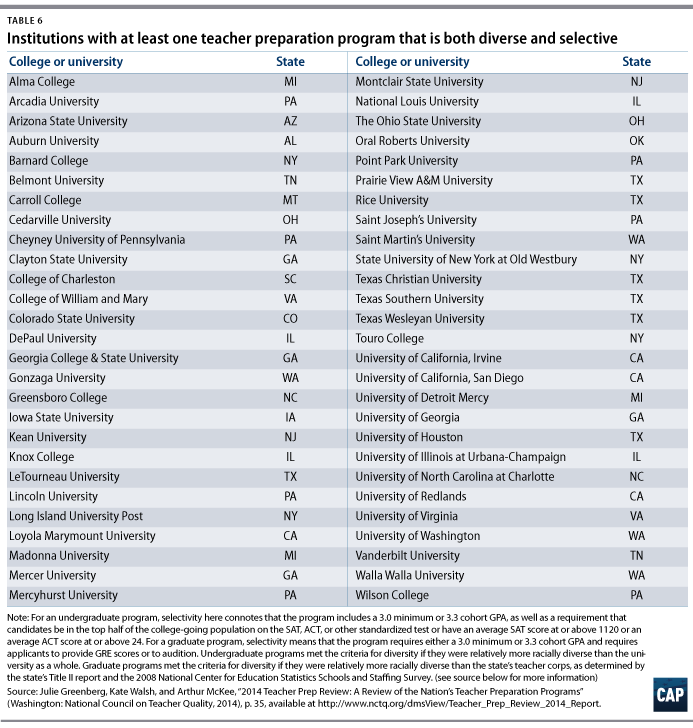 The table below shows 54 teacher preparation institutions from states across the country that house programs in which the student body is diverse and selected for their high GPAs or for being at the top of the class for college-bound high school students. While these institutions may not be highly selective overall, the teacher preparation programs housed within them have taken it upon themselves to maintain a high bar for program entry. The next subsections talk in-depth about three programs that have increased diversity while also increasing the rigor of their selection processes: Loyola Marymount University’s (LMU) School of Education, Teach For America (TFA), and the Boston Teacher Residency (BTR). The first program highlighted is taken directly from Table 6 and has received accolades from a number of organizations for its selectivity and commitment to diversity, not just in its student body but also in the coursework it provides to prospective teachers and in its community partnerships. TFA’s success in recruiting a diverse corps is based on a strategy of hands-on recruitment that actively works to reach students of color where they are. The entire recruitment team is responsible for meeting the organization’s diversity goals, and they receive specialized training to help them connect with potential applicants from many backgrounds. The organization makes a point of meeting with candidates individually or in small groups to begin building relationships, rather than waiting for potential candidates to come to them. Applicants are assessed on each of the above characteristics throughout the screening process. As of 2015, the BTR started shifting into research and development mode to pilot a more financially sustainable training model: a neighborhood-based, Pre-K through 12th grade pathway of schools called Teaching Academies, designed to both serve as exceptional schools for students and families and to develop highly effective teachers.167 For the time being, this has necessitated a smaller teacher resident cohort. Leaders anticipate ramping up efforts again in the near future to ensure a steady stream of diverse teachers into BPS for years to come. The analyses and examples included in this report give reason to believe that increasing selectivity into the teaching profession can be done without adversely affecting diversity. But given the disparities that exist—particularly in potential teachers’ performance on standardized tests—it is still important to be cautious about increasing cut scores for various entry points into the profession. Some of the programs that have done an exemplary job of supporting both teacher selectivity and diversity followed paths that can provide lessons for others to emulate. First, these programs have established a selective but reasonably flexible bar for academic standards supplemented by factors such as behavioral competencies that are thought to predict success in the classroom. Second, they have greatly expanded their candidate pools via high-touch recruitment efforts that seek out and support people of color. Based on these two principles and other lessons from the authors’ analyses, this section outlines recommendations for state leaders and policymakers and for traditional and alternative teacher preparation programs. Increase the potential pipeline of teachers of color by increasing the college readiness and high school graduation rates of students of color. Efforts to increase the number of students of color who attend and graduate from college may be a powerful lever for increasing the diversity of the teaching profession. State policies to raise standards so that they are aligned to college and career readiness, to increase high school graduation rates, and to provide supports for first-generation college students can all indirectly contribute to increasing the diversity of the teaching profession. Require that all programs in the state, at a minimum, attain CAEP accreditation or meet similar requirements. While some states may want to set up state-specific systems, all states should have a set of high standards for educator preparation. These standards should include a high but flexible bar for entry—CAEP’s is a 3.0 cohort GPA, recommended below for all teacher preparation programs—and meaningful coursework and clinical preparation requirements that are aligned with research and linked with higher performance once in the classroom. Include public reporting on the diversity of students and faculty. With an eye toward a statewide goal of increasing the diversity of both students and faculty at preparation programs, schools of education and alternative certification programs should report on the results of their work to attract and recruit diverse teacher candidates and faculty members. Increasing every school of education’s diversity should also be considered in the recertification process. Prevent new programs from opening unless there is a demonstrated need. For institutions of higher education and alternative certification providers seeking to create new teacher education programs, the approval process should include a requirement that they provide data justifying the need for additional programs in their state or region. Allow a phase-in period for the above changes. States should expect teacher preparation programs to improve but provide time and support for the transition. States should follow Rhode Island’s lead in allowing for a pilot period to set up program providers for future success under the new guidelines. During the pilot period, states should meet individually with representatives from each preparation program to discuss data on accepted applicants, broken out by academic and demographic indicators. Or they should follow the example of New York, which rolled out its reforms gradually over several years, giving preparation programs a chance to adjust one step at a time. Provide grant funding for innovative and/or evidence-based recruitment plans and implementation. This funding should be combined with technical assistance such as sharing tools, training materials, and best practices for one-on-one, high-touch recruitment that expands the candidate pool. These tools and resources could help programs set, meet, and record goals around face-to-face contact and follow-up. Close emergency certification routes and fill vacancies with high-quality alternative certification candidates whenever possible. This policy change was a key part of New York’s success, and too many states are responding to current teacher shortages by allowing for more emergency licenses rather than closing this loophole into the profession. Increase teacher pay and reduce the cost of education for prospective teachers. Higher pay can attract potential teachers of all backgrounds and ethnicities to the profession. All teachers deserve to earn salaries that are at least commensurate with the salaries of other similarly educated and experienced professionals. Given other industries’ interest in diversifying their workforces, potential teachers of color are often heavily recruited for other professions, exacerbating the impact of teacher compensation in attracting teachers of color. Teacher compensation should be high enough to attract and retain students from all backgrounds. It should also be sustainable so that teacher candidates and teachers know they can count on their current salary for the long term. Just as increasing teacher pay will increase the diversity of the teaching profession, altering other elements of teacher working conditions will also help boost diversity. Improved pay will be most effective as a recruitment lever for high-achieving, diverse candidates if it is coupled with the kinds of working conditions that such candidates can expect in other professional fields, such as high-quality onboarding or induction, relevant professional learning opportunities, opportunities to collaborate with colleagues, and opportunities to advance within the profession. The cost of college and the burden of student loans can be problematic for many low-income and first-generation students. State-funded loan forgiveness or scholarships for high-achieving individuals to go into teaching would also reduce some of the financial concerns associated with a career in teaching. Although this report deals primarily with selectivity as it relates to entry into teacher preparation and alternative certification, states can also increase the selectivity of the teaching profession through their licensure systems. Raising cut scores, switching to high-quality and predictive performance-based assessments, and implementing tiered licensure systems in which there are high standards and expectations for professional accomplishment—beyond readiness to teach—are all levers available to states seeking to increase selectivity. As with selectivity in preparation, it is important to be cautious of how these levers may affect the diversity of the profession if implemented arbitrarily or without thoughtful planning. Maintain flexibility at the individual level when increasing academic standards and/or use multiple measures or multiple measurement options. Teacher education programs should follow CAEP’s recommendation for a 3.0 GPA for a program’s entire entering cohort so that some individuals who have promise based on other measures but don’t quite meet the GPA cutoff are still eligible.168 This ensures that a promising candidate is not categorically denied entry but also keeps the general standard quite high. Even though the target GPAs for Rhode Island, LMU, TFA, and the BTR are different, each organization has adopted similarly flexible guidelines. For states that prefer to use an entrance exam, giving applicants the opportunity to use one of several options or to couple their results on said exam with other relevant application materials can have a similar effect. Measure competencies associated with highly effective teachers and invest in research that will improve how predictive those measures are for teacher effectiveness. Instead of relying solely on blunt academic cut-points, teacher education programs should follow the lead of programs such as the BTR and TFA, where academic proficiency requirements are high but competencies are equally important. Philanthropic or government funders could assist in this process by funding rigorous study of the relationship between teacher competencies and student outcomes to determine which measures and what levels of performance best predict how much students will learn. They can then disseminate their findings widely within the education field. Invest in a strategic recruitment campaign with targets and goals to expand the selection pool. As TFA and the BTR have done so effectively, teacher education programs should talk with potential candidates of color face-to-face about the benefits and value of teaching, as well as the opportunity to give back to the community. Good places to start include HBCUs and Hispanic-serving institutions; high schools and colleges with high percentages of high-achieving students of color; and community or faith-based groups. Teacher education programs should send student ambassadors to such groups and organizations and ask alumni of color to reach out to their networks. Rather than chance, they should also rely on data tracking by tracking first contact and follow-ups and hold recruiting staff accountable for meeting with a target number of students of color. Taken together, these recommendations—which have been successfully employed by some teacher preparation programs—provide several options for other such programs to more intentionally recruit diverse, high-achieving students into the teaching profession and provide them with support. Increasing the number of excellent teachers in U.S. classrooms by cultivating a more selective and diverse cohort of teacher candidates is key to improving students’ future outcomes. States and teacher preparation programs should seek to improve the selectivity and diversity of their teacher candidate pools, and state education agencies and policymakers should support these efforts at all levels. While both goals must be considered simultaneously, the analyses in this report give reason to believe that there is room for states and preparation programs to make changes to selectivity without adversely affecting diversity. There is also reason to believe that programs and states could be doing much more to recruit diverse individuals into the teaching profession at higher rates. These changes have the potential to improve the U.S. education system for all students as they see more and more teachers of color in their classrooms throughout their educational careers—teachers who are smart, capable, and respected by society at large as part of a challenging, selective, and highly valued profession. Lisette Partelow is the director of K-12 Strategic Initiatives at the Center for American Progress. Angie Spong previously consulted for Public Impact and now practices law in Chapel Hill, North Carolina. Catherine Brown is the vice president of Education Policy at the Center. Stephenie Johnson is the associate campaign director for K-12 Education Policy at the Center. Thanks to Christina Baumgardner, Meg Benner, Annette Konoske-Graf, Cherry Mullaguru, Hoang Murphy, Nathalie Navarrete, and Angie Spong and her Public Impact colleagues, who contributed to this report through research assistance, analysis, and writing. Thanks to peer reviewers Cassandra Herring, Mark LaCelle-Peterson, Melissa Tooley, and Matt Walker. Thanks also go to Rhea Handa and Sydney Young, interns on the K-12 Education team, who contributed research assistance. *Correction, September 15, 2017: This report has been updated to state the correct name of the National Council on Teacher Quality.